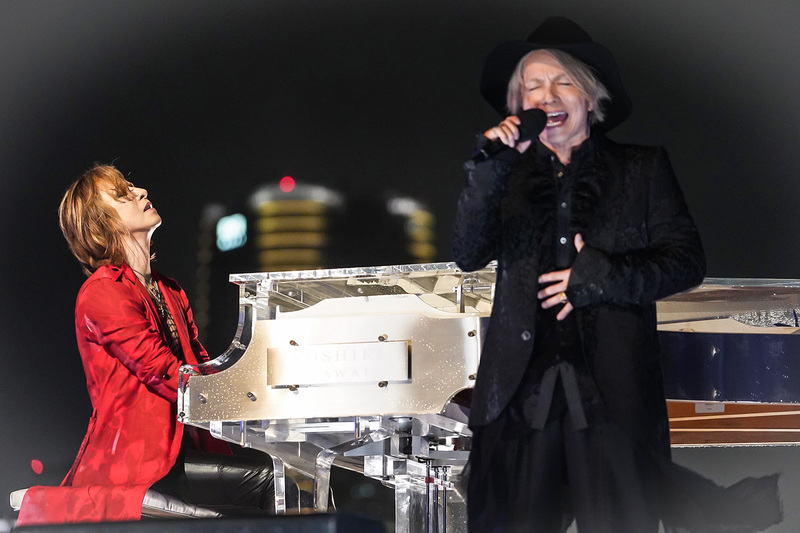 YOSHIKI and HYDE unveiled the long-awaited full version of the new "Attack on Titan" theme song, “Red Swan,” on Music Station Ultra Fes 2018, broadcast September 17 on TV Asahi in Japan. On the roof of the TV Asahi building at night, where it had been raining up until just moments before, the superstar musicians performed their first-ever TV collaboration. YOSHIKI played his crystal piano as HYDE delivered the mixed English-Japanese lyrics with the brightly-lit Tokyo Tower in the background. 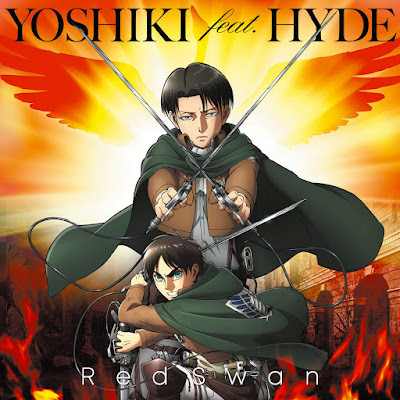 YOSHIKI and HYDE premiered the completed recording of “Red Swan” — composed by YOSHIKI for the third season of the hit anime series — on YOSHIKI CHANNEL two days earlier on September 15, where they also revealed details of the CD covers and the October 3 worldwide release date. During the September 15 “YOSHIKI x HYDE” YOSHIKI CHANNEL broadcast two days earlier, YOSHIKI revealed that “Red Swan” had just been completed a few days earlier in Los Angeles. He also mentioned that he’s been listening to the final version of “Red Swan” quite often. YOSHIKI gave some insight into the stories behind the two CD covers. First, as the “YOSHIKI feat. HYDE disc” CD cover that was unveiled, YOSHIKI explained that it was designed with elements of the cover for “Rusty Nail”, with the blue blood trickling down. He also mentioned that a brand new illustration was created especially for the “Attack on Titan” version of the CD. At the end of the broadcast, YOSHIKI had a heartfelt message for HYDE. YOSHIKI and HYDE are scheduled to team up again for a performance on October 28 at HYDE’s Halloween Party 2018. This will be the third time YOSHIKI has performed at the Halloween Party. HYDE asked what kind of Halloween costume he had planned for this year, YOSHIKI immediately responded “Attack on Yoshiki,” prompting laughter from the audience. The pair also shared the news that HYDE is set to appear for a guest performance during November’s YOSHIKI CLASSICAL 2018 ~Two Violet Nights~ YOSHIKI with Philharmonic Orchestra event in Tokyo, YOSHIKI’s first classical concerts since his two back-to-back sold-out performances at Carnegie Hall in January 2017. November 12 – Doors open 18:00 / Start 19:00 p.m.
November 15 – Doors open 18:00 / Start 19:00 p.m.